Context: Endodontic retreatment is performed in teeth with endodontic failures. The main goal of retreatment is cleaning and shaping of the root canal with removal of old root filling material. Hand instruments and rotary instruments are mainly used for removing this filling material. Aim of Study: To compare the relative efficacy of three rotary instrumentation systems for removal of gutta-percha from root canal during endodontic retreatment. Objective of Study: To find out which NiTi system is more efficacious in retreatment and to check out the efficacy of retreatment with and without use of solvent. Materials and Methods: Sixty freshly extracted, single-rooted human mandibular premolars were instrumented with K-files, and each root canal was filled with gutta-percha and AH Plus (Dentsply Detrey, Konstanz, Germany) sealer using lateral compaction. Specimens were then divided into three experimental groups with twenty specimens each. Groups were then subdivided into ten specimens each. Groups were then retreated either with or without solvent. The removal of gutta-percha was performed using ProTaper retreatment files, Mtwo retreatment files, and R-Endo files after 2 weeks. The amount of root canal filling material remnant in the coronal, middle, and apical thirds was measured using stereomicroscope and computer image analysis program. Statistical Analysis Used: Data were evaluated statistically using analysis of variance. Results: ProTaper group was found to have less remnant filling material as compared to the other groups in coronal and middle thirds, but a significant difference was observed between ProTaper and Mtwo and Mtwo and R-Endo in the nonsolvent groups (P < 0.05). Mtwo group demonstrated less amount of remaining filling material in the nonsolvent group. Conclusions: Both nickel–titanium systems and ProTaper and Mtwo retreatment file systems, were found to be effective in the removal of root canal filling material. However, complete removal of gutta-percha from root canals did not occur with any of the experimental groups. Failures are the pillars of success. Endodontic failures are no exception and hence would need retreatment. The main goal of retreatment is cleaning and shaping of the root canal with removal of old root filling material, and this can be achieved by either hand instruments or rotary instruments. Endodontic retreatment can be done either by nonsurgical retreatment (orthograde) or by apical surgery (retrograde). The main goal of orthograde retreatment is regaining access to the apical foramen by complete removal of root canal filling material, thus facilitating sufficient cleaning and shaping of the complete root canal system and then final obturation. 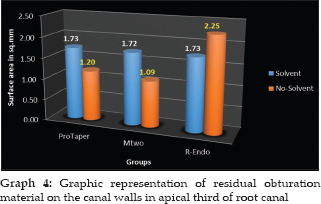 The aim of this study was to compare the three rotary instrumentation systems – ProTaper Universal retreatment rotary system, Mtwo retreatment rotary system, and R-Endo retreatment rotary system on the basis of efficacy in removing gutta-percha from the root canal during endodontic retreatment. Various rotary nickel–titanium (Ni–Ti) files and rotary instrumentation systems such as Profile (Dentsply Tulsa Dental, OK, USA), Quantec (Sybron Dental Specialities, CA, USA), K3 (Sybron Dental Specialities, CA, USA), and RaCe (FKG Dentaire, Germany) have been introduced for removal of root filling materials and have proved to be more efficient and safer than the traditional hand files.,,,, ProTaper Ni–Ti rotary system has been upgraded to the ProTaper Universal retreatment system which includes shaping, finishing, and retreatment instruments. The three retreatment instruments are designed for removing filling materials from root canals and have various tapers and diameters at tip. D1, D2, and D3 have diameter sizes 30, 25, and 20 with 0.09 taper, 0.08 taper, and 0.07 taper, respectively. Full length of these retreatment files is 16 mm for D1, 18 mm for D2, and 22 mm for D3. These instruments have convex, triangular cross-section, and D1 has an active working tip that facilitates its penetration into filling materials. Recently, newer rotary systems have been introduced such as Mtwo (VDW, Padova, Italy) and R-Endo (Micro-Mega, Besancon, France) for removal of root filling materials. Sixty freshly extracted, single-rooted human mandibular premolars were collected and stored in 10% formalin until further use. The criteria for selection were the teeth should have single straight canal, completely formed apices and with no cracks, caries, resorption defects, and canal calcifications. Crowns of selected teeth were decoronated using diamond disc (Carbodent; Gysi S.A, Buenos Aires, Argentina) to standardize the working length to 16 mm for each specimen. Access preparation was done on each tooth using high-speed Endo access bur with water spray. A size 10 K-type file was inserted into the canal until it was visible at the apical foramen to ensure that the canal was patent. Working length was established 1 mm short of this length. Coronal two-thirds were flared using no. 1, 2, 3 Gates Glidden drills. Canal instrumentation was completed using K-type files to master apical file size 25 and step back in 1 mm increment to file size 55. Apical patency was maintained with 10 K-type file. At each change of instrument, canals were irrigated with 5 ml of 5.25% sodium hypochlorite for removal of debris followed by smear layer removal with the help of 5 ml of 17% ethylenediaminetetraacetic acid (EDTA) (DentWash, Prime Dental, Mumbai) for 3 min. Final rinse was done with 5 ml of distilled water to remove the previously used solutions. To minimize experimental variables in canal preparation, all the procedures were performed by a single operator using standardized technique. Root canal of each tooth was dried with paper points and obturated with gutta-percha and AH Plus sealer using lateral compaction. A master gutta-percha cone size 25 was selected and tugback was checked. AH Plus (Dentsply DeTrey, Konstanz, Germany) sealer was mixed and master cone coated with sealer was inserted into the canal. Spreader was inserted to within 2 mm of working length to laterally pack the gutta-percha. Accessory cones were coated with sealer and inserted into the canal until it was completely filled. Access cavities were filled with temporary material. Specimens were radiographed in buccolingual direction to confirm the adequacy of root filling. All specimens were kept at 37°C for 2 weeks at 100% humidity to allow complete setting of the sealer. Group 3: R-Endo Ni–Ti rotary instrumentation system. R-Endo files were used in gentle in-and-out motion at constant speed of 300 rpm as per manufacturer's recommendation. Rm (size 25; 4% taper) was used for initial preparation, to create pathway thus allowing the centering and alignment of next instrument. Re (size 25; 12% taper) (length 15 mm) was used 1–3 mm beyond the pulp chamber to remove the initial bulk of obturation material. R1 (size 25; 8% taper) (length 15 mm) was used in the coronal third, R2 (size 25; 6% taper) (length 19 mm) was used in the middle third, and R3 (size 25; 4% taper) (length 23 mm) was used in the apical third. One set of retreatment files was used for re-preparation of five root canals. Files were wiped regularly using gauze piece soaked in normal saline to remove obturation material and debris. Each root canal was prepared, filled, and retreated by the same operator to reduce the interoperator variability. Roots were grooved longitudinally, in buccolingual direction, into two halves with diamond disc such that the groove was in proximity of the root canal wall but not cutting into the wall of the canal. The root was split using a chisel and mallet. After tooth splitting, each half of every specimen was separately imaged. Digitized images of each third of the root canal of each half of every specimen were obtained at ×16 original magnification. Area parameters on each half of the specimen were obtained and added to the corresponding values of the other half of the same specimen to obtain the final value of each specimen. Amount of gutta-percha and sealer on canal walls was imaged in standardized way in both sections of the tooth and measured in square millimeters using the feature of image analyzer software connected to stereomicroscope with ×16 magnification with an attached digital camera (Nikon SMZ 1500) and computer system utilizing a Pentium III processor. Surface area covered by residual obturation material was measured in square millimeters with and without solvent. The mean total surface area covered by residual obturation material and the mean percentage of residual obturation material in the coronal third, middle third, and apical third were statistically evaluated for all groups. Parametric one-way analysis of variance test was used to identify significant differences between various groups. Significance level was set up at P = 0.05. 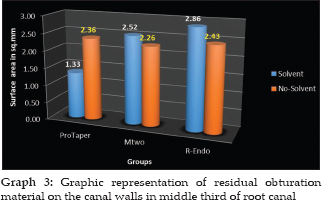 When total surface area of canals was compared, ProTaper Universal retreatment Ni–Ti rotary instrumentation system demonstrated cleaner canals as compared to other groups [Graph 1]. When area covered by residual obturation material in the coronal third was compared, ProTaper Universal retreatment Ni–Ti rotary instrumentation system demonstrated cleaner canals with use of solvent as compared to other groups whereas Mtwo retreatment Ni–Ti rotary instrumentation system demonstrated cleaner canals compared to other two groups without use of solvent [Graph 2]. When area covered by residual obturation material in the middle third was compared, ProTaper Universal retreatment Ni–Ti rotary instrumentation system demonstrated cleaner canals as compared to other two groups [Graph 3]. 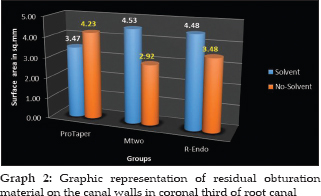 When area covered by residual obturation material in the apical third was compared, Mtwo retreatment Ni–Ti rotary instrumentation system demonstrated cleaner canals without use of solvent as compared to other two groups [Graph 4]. Various systems had been applied for the removal of root canal filling material from canals which includes stainless steel hand files, Ni–Ti files, ultrasonic files, and lasers. Usage of conventional files has been found to be a quite tedious and time-consuming procedure for the operator to remove a well-condensed obturating material and might also cause endodontic mishaps. Ni–Ti files possess superelasticity which allows more centered canal preparations with less transportation of the canal and a decreased incidence of canal aberrations. Furthermore, the increased taper preparation facilitates adequate irrigation. These files have a greater cutting efficiency once engaged in a crown-down approach and a continuous reaming motion. Consequently, rounder root canal preparations, with less straightening and a smaller amount of apical extrusion, are achievable. In spite of their increased flexibility, separation is still a concern with Ni–Ti files. Studies done by Tasdemir et al. and Bramante et al. demonstrated that ProTaper, ProTaper Universal retreatment files and Mtwo Ni–Ti rotary instrumentation system are faster and more efficient in removal of obturation material than hand files., The purpose of this study was to evaluate the efficacy of removal of gutta-percha from the root canals using ProTaper Universal retreatment files, Mtwo retreatment files, and R-Endo files using a gutta-percha solvent and without using a gutta-percha solvent. 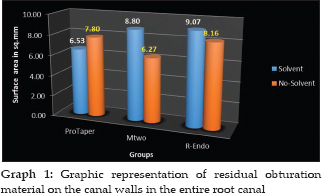 Different methods have been reported to evaluate the amount of root canal filling material remnant inside the canals during the retreatment procedure. Remaining root filling material can be assessed using radiography and can be measured linearly using a scoring system by splitting teeth longitudinally and making teeth transparent or using computer digitized images of canals using operating microscopes. Radiography is commonly used method to evaluate the residual obturation material in root canals. However, radiographical assessment produces two-dimensional representation of a three-dimensional structure and may be subjected to magnification and distortion as mentioned by Unal et al. Hence, radiographs do not reveal all the residual filling material in the canal. Hence, to prevent the above shortcomings in this study, stereomicroscopic imaging technique under ×16 magnification was used to get a clear picture of the residual obturating material as suggested by Schirrmeister et al. The roots were grooved longitudinally and halved in buccolingual direction with diamond disks and chisel. Each half was divided into coronal, middle, and apical thirds as suggested by Kosti et al. and Akhavan et al., Evaluation of the remaining filling material was performed by obtaining digital images of each third of the specimen under stereomicroscope with ×16 magnification using image analyzer software. This procedure was undertaken to minimize the subjectivity that may be seen in evaluating methods using radiographs or photographs which are evaluated using scoring systems based on scales as used by Hülsmann and Stotz, Hülsmann and Bluhm, and Kosti et al.,, The entire area of the canal and the area of the remaining filling material in each third of canal were traced. The images of the traced canal area and the remaining filling material were overlaid and transferred to DX-312 software connected to stereomicroscope with ×16 magnification through a CCD sensor. Our results demonstrated that the use of ProTaper Universal retreatment instrumentation system with the use of solvent is more effective than Mtwo and R-Endo instrumentation systems in the coronal third and in the middle third of root canal system, whereas Mtwo instrumentation system without the use of solvent has been found to be more effective significantly than R-Endo instrumentation system and ProTaper Universal retreatment instrumentation system in the middle third and apical third of root canal system. The effectiveness of ProTaper Universal retreatment instrumentation is due to the convex triangular cross-section which renders a large internal area  than Mtwo and R-Endo instrumentation systems for removal of the root canal filling material. The Mtwo instrumentation system has a greater apical diameter and an active tip with a positive rake angle which allow the files to reach the apical third bypassing the filling, thus facilitating removal of filling material and making the file more effective in apical third of the root canal system. Significantly no difference was demonstrated between the solvent groups of the three instrumentation systems. This could be attributed to the fact that with the use of solvent, a fine layer of gutta-percha is formed that gets adhered to the canal wall, which is not found in case of nonsolvent groups, thus causing hindrance in the removal of gutta-percha from canal wall for all instrumentation systems as stated by Takahashi et al. (2009) and Kfir et al., Hence, a statistically significant difference has been found in nonsolvent groups of the three rotary instrumentation systems. In another study by Mollo et al., R-Endo instrumentation system was found to be better than Mtwo instrumentation system. This difference could be attributed to the fact that the study used R-Endo instrumentation system followed by Hero Shaper file with ISO size 35 for removal of the obturating material. The present study used only the R-Endo instrumentation system with ISO size 25 for removal of the obturating material. From the present study, it can be concluded that both the retreatment rotary instrumentation systems, ProTaper Universal and Mtwo, were found to be effective in the removal of gutta-percha from the root canal. While ProTaper Universal was found to be equally effective with/without the use of solvent, Mtwo retreatment rotary instrumentation system showed increased effectiveness in removal of gutta-percha without the use of solvent. Torabinejad M. Orthograde retreatment. Principles and Practice of Endodontics. 3rd ed. Philadelphia, PA: Saunders; 2002. Stabholz A, Friedman S. Endodontic retreatment – Case selection and technique. Part 2: Treatment planning for retreatment. J Endod 1988;14:607-14. Jayasenthil A, Sathish ES, Prakash P. Evaluation of manual and two-rotary NiTi retreatment systems in removing gutta-percha obturated with two root canal sealers. ISRN Dent 2012;2012:208241. Ferreira JJ, Rhodes JS, Ford TR. The efficacy of gutta-percha removal using ProFiles. Int Endod J 2001;34:267-74. Saad AY, Al-Hadlaq SM, Al-Katheeri NH. Efficacy of two rotary NiTi instruments in the removal of gutta-percha during root canal retreatment. J Endod 2007;33:38-41. Cohen S. Nonsurgical retreatment. Pathways of Pulp. 10th ed. Amsterdam: Elsevier; 2010. Schirrmeister JF, Meyer KM, Hermanns P, Altenburger MJ, Wrbas KT. Effectiveness of hand and rotary instrumentation for removing a new synthetic polymer-based root canal obturation material (Epiphany) during retreatment. Int Endod J 2006;39:150-6. Taşdemir T, Er K, Yildirim T, Celik D. Efficacy of three rotary NiTi instruments in removing gutta-percha from root canals. Int Endod J 2008;41:191-6. Bramante CM, Fidelis NS, Assumpção TS, Bernardineli N, Garcia RB, Bramante AS, et al. Heat release, time required, and cleaning ability of MTwo R and ProTaper universal retreatment systems in the removal of filling material. J Endod 2010;36:1870-3. Mushtaq M, Farooq R, Ibrahim M, Khan FY. Dissolving efficacy of different organic solvents on gutta-percha and resilon root canal obturating materials at different immersion time intervals. J Conserv Dent 2012;15:141-5. Marques da Silva B, Baratto-Filho F, Leonardi DP, Henrique Borges A, Volpato L, Branco Barletta F, et al. Effectiveness of ProTaper, D-RaCe, and Mtwo retreatment files with and without supplementary instruments in the removal of root canal filling material. Int Endod J 2012;45:927-32. Unal GC, Kaya BU, Taç AG, Keçeci AD. A comparison of the efficacy of conventional and new retreatment instruments to remove gutta-percha in curved root canals: An ex vivo study. Int Endod J 2009;42:344-50. Kosti E, Lambrianidis T, Economides N, Neofitou C. Ex vivo study of the efficacy of H-files and rotary Ni-Ti instruments to remove gutta-percha and four types of sealer. Int Endod J 2006;39:48-54. Akhavan H, Azdadi YK, Azimi S, Dadresanfar B, Ahmadi A. Comparing the efficacy of Mtwo and D-RaCe retreatment systems in removing residual gutta-percha and sealer in the root canal. Iran Endod J 2012;7:122-6. Hülsmann M, Stotz S. Efficacy, cleaning ability and safety of different devices for gutta-percha removal in root canal retreatment. Int Endod J 1997;30:227-33. Hülsmann M, Bluhm V. Efficacy, cleaning ability and safety of different rotary NiTi instruments in root canal retreatment. Int Endod J 2004;37:468-76. Mollo A, Botti G, Prinicipi Goldoni N, Randellini E, Paragliola R, Chazine M, et al. Efficacy of two Ni-Ti systems and hand files for removing gutta-percha from root canals. Int Endod J 2012;45:1-6.